Simply the most terrifying clown and santa I have ever seen. Quick, somebody called 911. 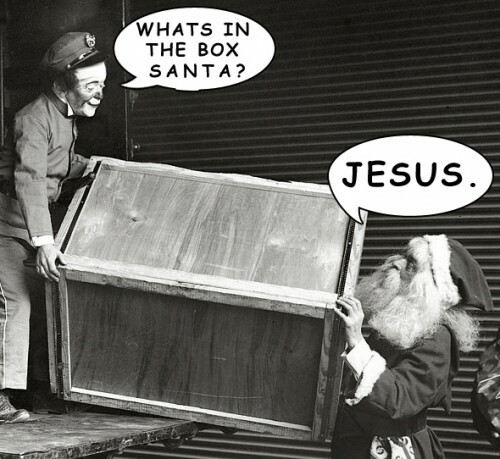 Santa murdered Jesus!! Dat Bastige!! It’s the Six Million Dollar Jesus. They’re going to put him back together. Make him bigger.. stronger.. faster.. and, he gets to bang Lindsay Wagner. @AgZed: Translation: I seem to be rather confused that the clown is referring to the container in question as a box, when it is quite clearly a crate.